Download archive with configuration files in section "My account". Extract files from it to any folder on flash card or internal memory in your smartphone or tablet. Also, on "Subscriptions" page you can check connection credentials. 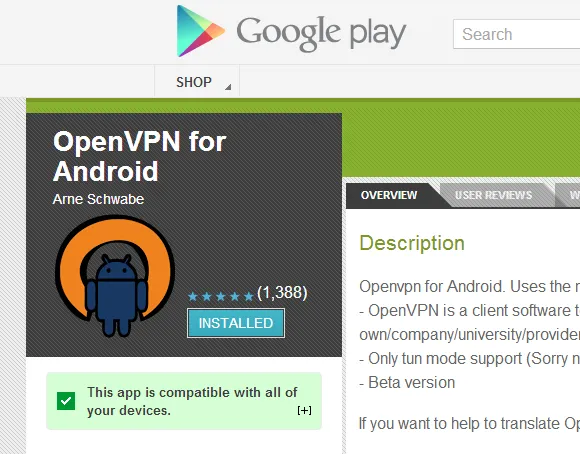 Install the "OpenVPN for Android" application from Google Play Store. It's free and don't require root access. 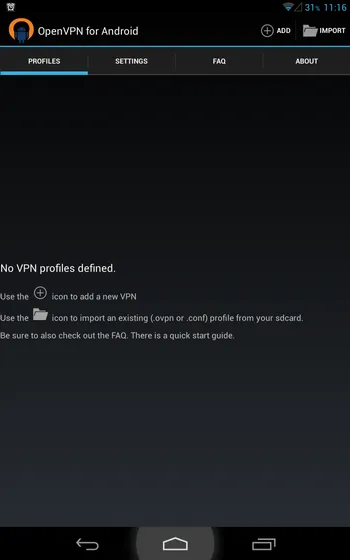 Launch the the OpenVPN for Android and press "Import" button in upper right corner. 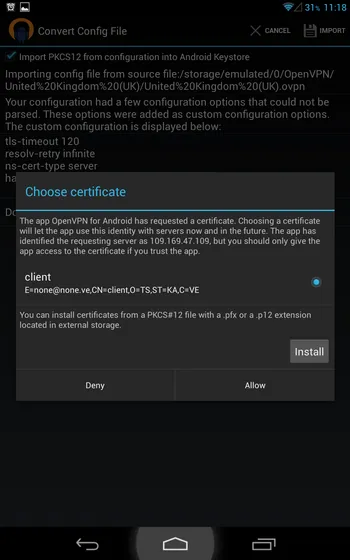 In "File Explorer" find and open file with OpenVPN settings. It has a ".ovpn" extension. You will see a brief information about this connection. Press "Import" button in right upper corner. After it you'll be prompted for a certificate password. Leave this field empty. 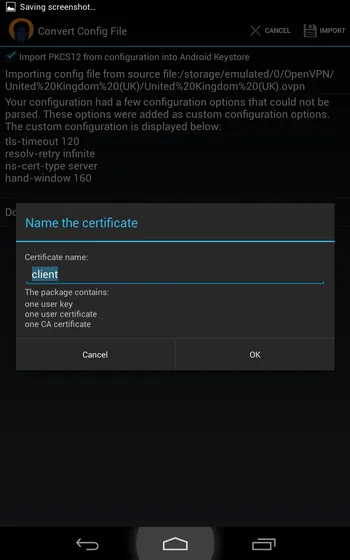 Then you will be asked for certificate name. Leave it default – "client". System will ask you to setup a PIN-password to lock your device. You can select any type of protected lock. But please, be careful – if you forget or lose this password, you'll be unable to unlock device. You'll be asked about new certificate. Press "Allow" button. 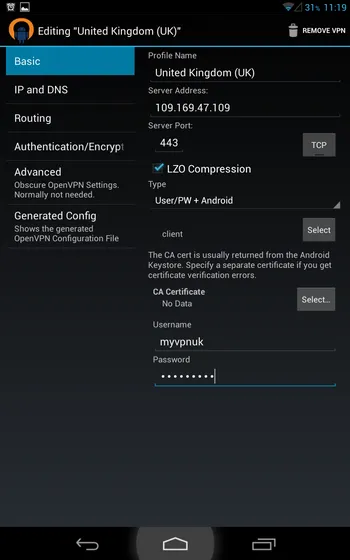 Your connection should be displayed at OpenVPN for Android main menu. But it's not ready – login and password must be entered. Press "Settings" button in right side on connection name. On this page you must enter login in "Username" field and "Password". These are not your credentials from TheSafety.US site. Credentials for connection could be found in section "My account". Now your connection is ready and should be fully functional. Click on it's name and it should be established. 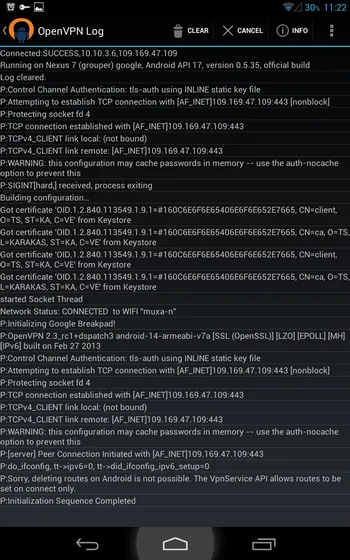 You will see a full log of connection process. 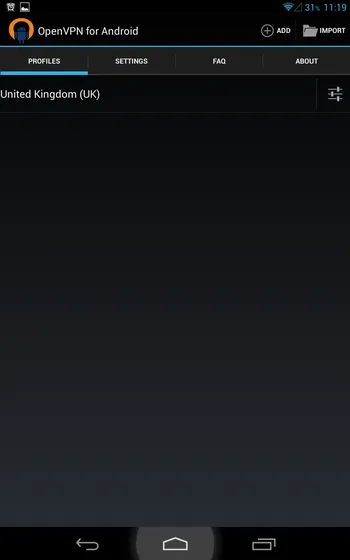 When connection established, OpenVPN icon will be displayed in notification bar.